Bald Mountain is one of almost 100 summits in the state named with "Bald." In fact the Bald Peaks, also in Santa Clara County, are only a few miles from this Bald Mountain. It had caught my attention when I was looking for a route from the north to Loma Prieta, and getting lost I spent almost an hour climbing the wrong slope which I later found led to Bald Mountain. I made a note to pay it a more formal (that is, intentional) visit. It took my friend Steve and I two tries to reach the top. Both efforts started from Almaden Reservoir at the corner of Hicks and Alamitos Rds. At this juncture, the Sierra Azul Open Space Preserve reaches its furthest point east, just dipping down to the corner of the intersection. This is the long, 1.5mi East Ridge of Bald Mountain. There is no ready access or trail here, just a sign indicating the preserve boundary and and an old barbed-wire fence surrounding the property. The 7.5' topo shows a road on a portion of the ridge, but not much else. When I viewed the ridge from nearby Fern Peak, it looked like one might find a grassy route along the ridge - at least the top and bottom were grassy, and I figured maybe the rest wasn't so bad once you got close. Our first effort had been two weeks earlier on an overcast day following a few days of rain. The hillside was damp, but not soaked and would not be hard to get a footing on. Things started off nicely after breaching the perimeter fence, a modestly steep climb up the grassy slopes we were hoping for. Flowers dotted the landscape and the air was clean and fresh. It seemed a cinch. This lasted for all of about 20 minutes. We found the old road indicated on the topo map, but this and the grassy slope ended somewhat abruptly. We were confused at first, wandering around two sides of the rounded ridge looking for our road and a way up. We lost maybe ten minutes in the effort before finding an old trail cut up the center of the ridge - so much for the easy part. Once in the brush things changed quickly. Though old cuts in the chaparral indicated someone had forged a trail up here at one point, it looked to be a number of years old and badly overgrown. Worse, the place was literally crawling with poison oak. Only a few leaves and vines at first, but soon it was apparent everywhere. Steve was better prepared than I, having a long sleeve shirt, but neither of us had brought gloves to fight through the thicket we were presented with. 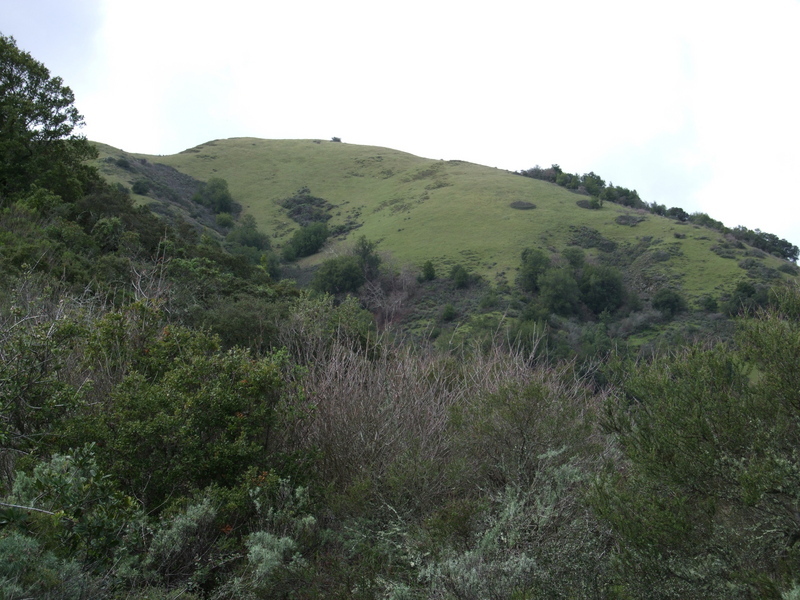 Still, we pushed on, highly wary of the poison oak, giving it a wide berth, at least at first. Eventually it became so ubiquitous that it was impossible to avoid and we had to write off our clothing below the waist as hopelessly contaminated. After an hour of pursuing this hard line for more than an hour, we finally came in sight of the grassy summit still about half a mile away. Steve gently reminded me that we might be late picking up the kids from school even if we turned around immediately. Somewhat frustrated, I agreed and we retreated. Luckily we weren't late picking up the kids. But despite an immediate shower using Technu as soon as I got home, I still broke out in small rashes in three or four places. Additional applications of this wonder drug immediately halted the progression before it became more than a small annoyance. I licked my wounds and waited. Rain came for a week. Then sunshine. Time to try it again. Steve jumped at the opportunity. In the midst of a job search, he seemed eager for any chance to get outside. Even if it meant poison oak. This time we came prepared. Fully clothed, including leather gloves, we were further armed with pruning shears to help reestablish the lost trail. It took us an hour to regain what had taken us an hour and half the first time, even with the time we took to chop and groom the trail into something decent. We did not get off-track half a dozen times as we had the first time up, though once past the turnaround point we again had sections where we floundered and struggled to find the old trail. The brush was dense and though not completely impenetrable, we did not have the time to forge a new trail. Nor did we have the will. We made several wrong detours of a hundred yards or more, but eventually turned back and with more sleuthing found the old trail once again. The poison oak was even worse with another two weeks of growth, and higher up it was everywhere. In succession we wrote off our lower bodies to contamination, then our loppers, gloves, sleeves, and eventually all our clothing. We could no longer wipe the sweat from our faces or itch our noses. We crawled through underbrush, hacked through stands of poison oak, followed deer tracks, and reveled whenever we found an old cut on a tree from the previous trail. A branch of the poison oak snapped back on my face, reaching into a nostril. Great. I've had rashes on many parts of my body, but this would be new. The thought of it made me wince. We pushed on. A group of 8-10 older hikers casually making their way to the top just ahead of us. I turned to Steve, "Hey, looks like there's a trail to the top from the other side!" Indeed there was. Had I bothered to look at Google maps the wide dirt road leading to the summit from the west would have been obvious. Heck, it was even on the topo map (which I didn't have with me at the time), but somehow I had dismissed it, thinking it was private property on that side. With both our parties gathered on the summit, we felt foolish and somewhat overdressed with our gloves, loppers in hand. The summit is a wide, flat area with a fine view of the South Bay. Mt. Umunhum was surprisingly close to the southwest, Loma Prieta further off to the southeast. I hadn't realized just how high this subsidiary summit is off the main crest of the Santa Cruz Mountains. While the other group relaxed on the grass and ate their lunch, Steve and I plotted our return. We had about two hours before the kids would be out of school. The good news was we had an alternative descent route to consider. We could see the paved Mt. Umunhum Road about a quarter mile to the west. It would be all downhill on mostly pavement back to the reservoir if we went that way. We decided to make a loop out of it and get a jog in at the same time. The run down Mt. Umunhum and Hicks road was pleasant - primarily because it was all downhill. It took us only about 45 minutes to get back to the car, likely faster than if we had taken our mostly pruned trail back from the summit. Just avoiding a second wading through all the poison oak made it worthwhile. And unless others are as oblivious about the existence of the easy access from the west, it seems unlikely that anyone will be taking advantage of our newly groomed trail anytime soon - if ever.